Over the last week we've travelled south-east, across to the Eastern Sporades, visiting Skantzoura, Skiros and Psara. Skantzoura was little more than a low-lying lump of rock, inhabited by cicadas, but with a convenient anchorage for an overnight stop and a swim in clear water. The weather has continued to be cloudy and cool for the time of year so swims haven't been a priority. We had another good sail from there to Skiros, spending our first night in one of the anchorages on the SW coast, with just one other yacht for company. The next day we tried to go to the harbour, Linaria, but found it under re-construction, with a dredger taking up much of the room and making a lot of noise. The cafe and taverna owners along the harbour frontage were looking very glum as no one coming off the ferry was going to linger in those conditions. We anchored in a nearby bay and went ashore the next day to explore inland. The bus service is very infrequent so we managed to walk half way to the main town, 10 kms away, before we caught one. We got a taxi back. Skiros is a bit of an outpost, with poor transport links to the rest of Greece, so is not at all spoilt by tourism. The north of the island is green and wooded but the south is barren. The main town is a rambling hilltop affair with sprawl along the surrounding valleys. After a quick recce and shopping for provisions we decided to move on from our anchorage, which had been a bit uncomfortable with swell making the boat rock in the night. There was no wind so we motored around to the coast to anchor in a cove on a little island called Sarakino, just off the south coast of Skiros. The island is supposed to be the last remaining home of wild Skirean ponies, but we only saw wild and shaggy-looking goats. It was one of the most isolated spots we've ever been to with not even an occasional fishing boat for company. The anchorage was pretty small so we laid out two anchors to restrict our movement. On Saturday we were up at 4am for a long passage east to the little island of Psara, not far from Chios island. There was no wind so we motored all the way, with dolphins and big ships for company. The big ships were going to and from the Kafirea Strait, a bottleneck for traffic between Piraeus and the Northern Aegean. Psara is another barren island with just a small community living around the harbour. Our lines were taken by the nearest taverna owner and we had a really good meal there in the evening, sampling local cheese and some of the best marinated octopus ever. Being Saturday night everyone was out and about, the kids were all playing in the square until midnight and the cafe played music until 2am. We were then woken this morning by the Greek equivalent of the muslim call to prayer, with the various churches competing with there ding-a-ling bells and services broadcast on loud speakers for all to hear. Having walked up the hill to see the view, there was nothing to keep us on Psara and the wind was blowing so we set sail today for Chios, landing at Limnia on the west coast. 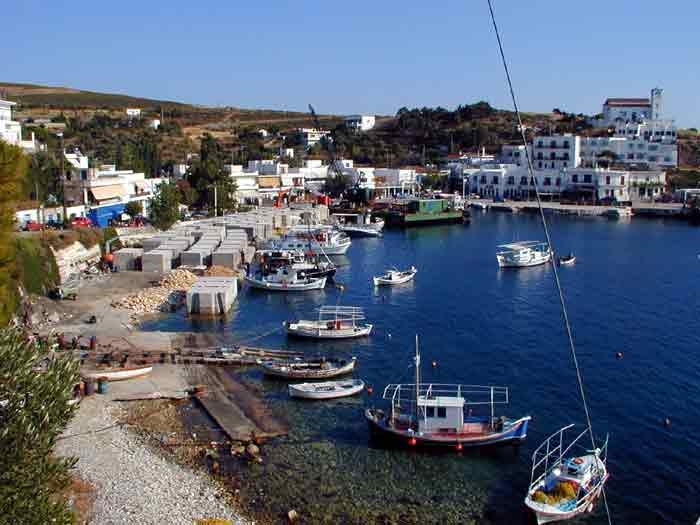 Limnia is little more than a fishing harbour, with room for an occasional ferry to Psara but it seems a popular spot for Sunday outings and the quayside cafes and tavernas are busy. The temperature has increased, reaching around 30 degrees C over the last two days so tomorrow we plan to head to an anchorage somewhere south of here. After that we'll be heading south again, towards the Dodecanese.